Jordanian King Abdullah II shed tears today as he visited Anıtkabir, the mausoleum dedicated to Mustafa Kemal Atatürk, the founder of modern Turkey. Turkish Finance Minister Mehmet Şimşek accompanied King Abdullah during his visit to Anıtkabir in Ankara. After the visit, King Abdullah was welcomed by Turkish President Abdullah Gül with a formal ceremony at the Çankaya presidential palace. Gül’s wife, Hayrünnisa Gül, accompanied Jordanian Queen Rania Abdullah at the ceremony. Following the ceremony, a commemorative photograph was taken before the Gate of Honor. Turkish Foreign Minister Ahmet Davutoğlu, Finance Minister Mehmet Şimşek and Presidential Secretary General Mustafa İsen attended the ceremony. 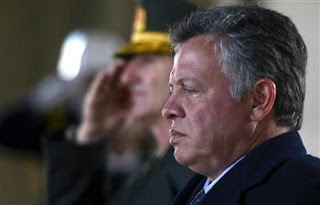 King Abdullah arrived in Turkey’s capital on a two-day official visit and expects to leave Turkey March.6. Jordanian King Abdullah II called on the Syrian regime to move toward an “inclusive transition” to prevent the breakup of the war-torn country. “Only an inclusive transition will stop sectarian conflict and avoid the fragmentation of Syria,” the king said at a press conference with President Abdullah Gül. King Abdullah said there was an “urgent need” for a political transition to stop the bloodshed and “preserve the territorial integrity” of Syria, where the nearly two-year-old conflict has claimed around 70,000 lives, according to U.N. figures. Gül said the conflict has sent half a million refugees to neighboring Jordan and Turkey, where leaders frequently call for international aid to cope with an influx that has drained their emergency resources. The United Nations is calling for $1.5 billion to help nearly one million Syrian refugees and four million other Syrians affected by the conflict but who remain inside the country, over the coming months.